If you are a cool, intellectual air-sign adult who is attempting to understand a stubborn earth-sign child, a hot-tempered fire-sign parent and a weepy, water-sign mother-in-law, this book will show you how to understand each of them. If you are a cool, intellectual air-sign adult who is attempting to understand a stubborn earth-sign child, a hot-tempered fire-sign parent and a weepy, water-sign mother-in-law, this book will show you how to understand each of them. Adam’s book is for those who have no expertise, because all you need to know is your own date of birth and those of the people you are keen to study. 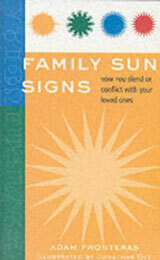 Be the first to review “Family Sun Signs – Adam Fronteras” Click here to cancel reply.